Duolingo has launched a Hindi language learning course for English speakers. And about time too. With over 500 million people speaking Hindi it’s one of the most widely spoken languages in the world. So Hindi should have been higher on Duolingo’s list of priorities. Duolingo is one of the best ways to learn a language online. It uses repetition and gamification to help you build a sizable vocabulary in your language of choice. This includes both Japanese Duolingo Now Helps You Learn Japanese Duolingo Now Helps You Learn Japanese Duolingo has been helping people learn languages since 2011. However, it doesn't yet offer courses in every language, including Japanese. Until now... Read More and Chinese You Can Now Learn Chinese Using Duolingo You Can Now Learn Chinese Using Duolingo With more than 1 billion speakers, Mandarin Chinese is the most-spoken language in the world, so it would probably serve us all well to learn a few words and phrases. Read More , which Duolingo added to its lineup in 2017. The latest language to get the Duolingo treatment is Hindi. 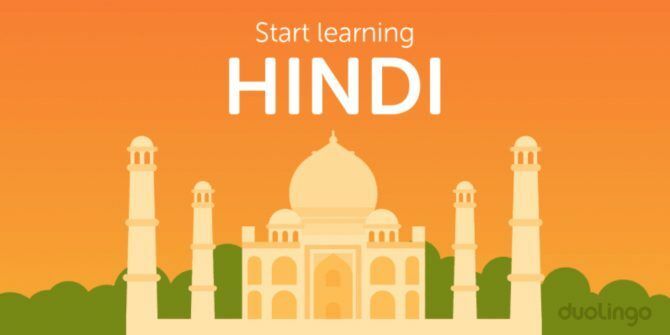 The Hindi language learning course has been in development for over a year, with various native speakers helping Duolingo pitch it just right. The resulting course should give you a solid grounding in Hindi. Hindi is one of the official languages of India (as well as Fiji), and learning it means you will be understood throughout the country. This makes it the perfect language for future tourists and people looking to move to India for work to learn. Duolingo already offers an English language learning course for Hindi speakers, which 8.6 million people are currently taking. So it made perfect sense to offer the opposite: a Hindi language learning course for English speakers. Duolingo is also already working on English language learning courses for people who speak Bengali, Punjabi, Telugu, and Tamil. However, there are currently no plans to offer Bengali, Punjabi, Telugu, and Tamil courses for English speakers. The Hindi language learning course is currently only available on the Duolingo website. However, it will eventually arrive on the Android and iOS apps as well. Still, thousands of people have already signed up to learn to speak Hindi through the Duolingo website. While I’m personally a big fan of Duolingo, there are other ways to learn a new language online The Best (Completely Free) Language Learning Alternatives to Duolingo The Best (Completely Free) Language Learning Alternatives to Duolingo Duolingo might not be for everyone. There are plenty of other great (and completely free) services out there that may be a better fit. Read More . However, if you do fall in love with Duolingo as I have, you might want to check out Duolingo Plus Duolingo Plus Makes It Easier to Learn a New Language Duolingo Plus Makes It Easier to Learn a New Language Duolingo has launched a paid subscription service designed to give language learners a leg-up. Paid subscribers will gain a couple of advantages over free users, all while keeping Duolingo in business. Read More , Duolingo Clubs Learn a New Language With Duolingo Clubs Learn a New Language With Duolingo Clubs Language learning can be tough, mainly because it's too easy to run out of steam and lose motivation. That's where Duolingo Clubs comes in to help. Read More , and Duolingo chatbots Duolingo Chatbots Help You Learn a New Language Duolingo Chatbots Help You Learn a New Language Duolingo already offers a fantastic way of learning a new language, but its new chatbots now add a friendly face to proceedings. Read More . Explore more about: Duolingo, Language Learning.